Guitar Kit 2.0 has released! 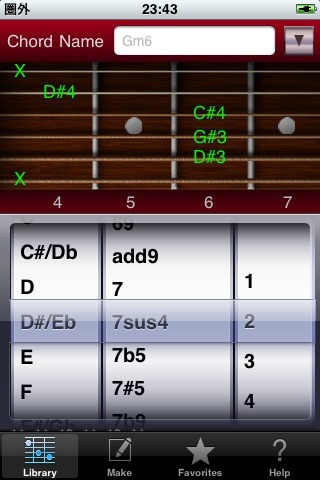 Guitar Chord Form app “Guitar Kit” for iPhone / iPod touch update to ver 2.0! This release is must have update. Because added Favorites Tab and fixed some issues! You can now more easily access to your favorite chord forms. Listen & view some chords by memory to Favorite Tab. It’s very cool idea! 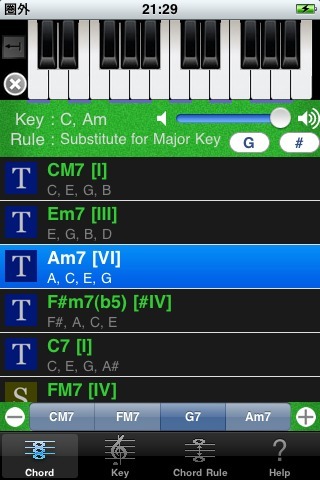 Songwriter’s assistant app “Chord NOTE” for iPhone / iPod touch update to ver 2.0! This release is must have update. Because more user friendly & very useful! Added Chord Progression function. Display consisted notes for the chord or key at top keyboard. Display note name animation when you tap keyboard. And now Guitar chord form app “Guitar Kit”, Real percussion app “PET Bottling” is 34 % off sale price! Guitar Kit 1.1 has released! 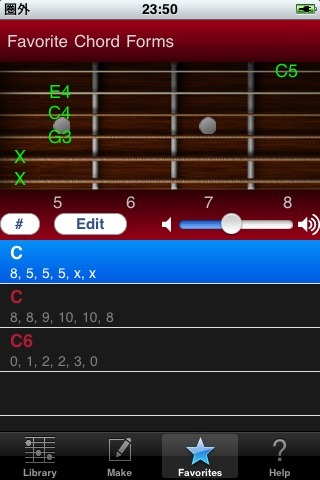 Guitar chord form searching app “Guitar Kit 1.1” for iPhone / iPod touch has released! Now you can input some Enharmonic Equivalents. And some minor fix improved.